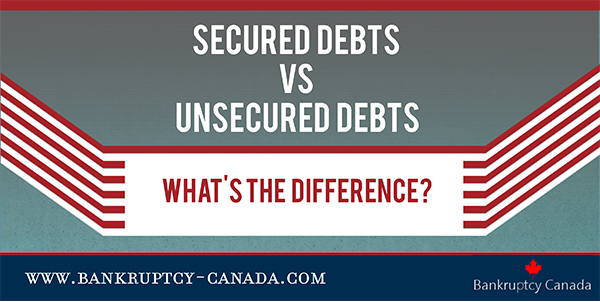 What is the difference between secured debts and unsecured debts when you declare bankruptcy in Canada? 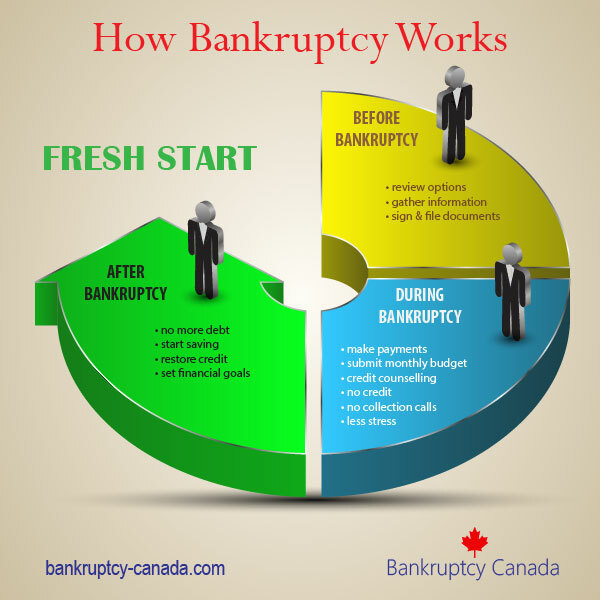 Bankruptcy is a chance to start over, and while it does eliminate most debts, it does not deal with them all. One of the biggest distinctions when filing bankruptcy is whether or not your debt is secured or unsecured. Secured debt is a debt that is guaranteed by having assigned some form of collateral. In the event of non-payment, a secured creditor can begin proceedings to seize the security you have pledged against the loan. Some common examples are house mortgages and secured car loans however almost any loan can be secured including lines of credit and bank loans. Even a credit card can be secured. A secured credit card is often used after filing bankruptcy to help you rebuild your credit. Secured debt can be created when you take out a loan (such as a mortgage) but can also be created by creditor action such as a lien, charge or other encumbrance placed on an asset you own (such as a tax lien on you home). The important thing to know is that secured debts are not included in a bankruptcy. If you own a home and file bankruptcy, assuming there is no equity in the home, you can continue to make your mortgage payments and live in your house. Also, a secured creditor cannot terminate your mortgage or secured loan just because you filed for bankruptcy in Canada. While bankruptcy does not discharge your secured debts, the fact that you no longer have to make payments towards you unsecured debts means you may have additional cash flow available each month to pay your mortgage or car loan, reducing the risk that you will lose those assets. In the event that you have equity in any asset that is secured by a mortgage or other debt, a consumer proposal is a great option that allows you to keep that asset. 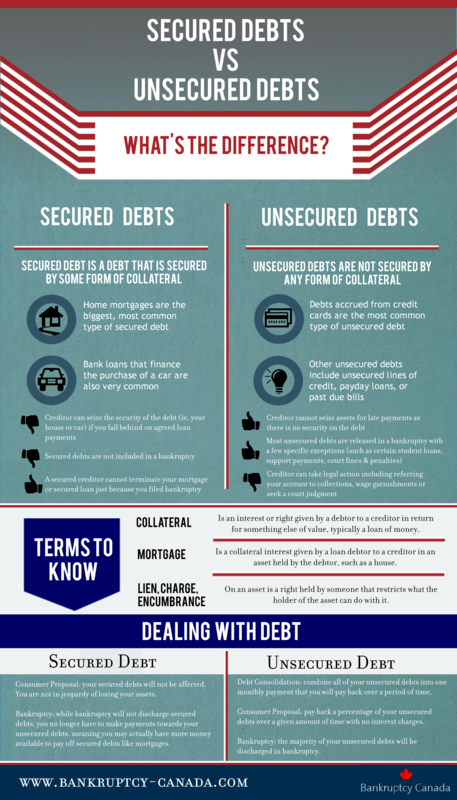 In contrast, unsecured debts are not secured by any form of collateral, asset or guarantee. The most common types of unsecured debts are credit card debt, unsecured lines of credit, payday loans and past due bills. Since you have not pledged any assets against these debts, creditors cannot seize anything for non-payment. 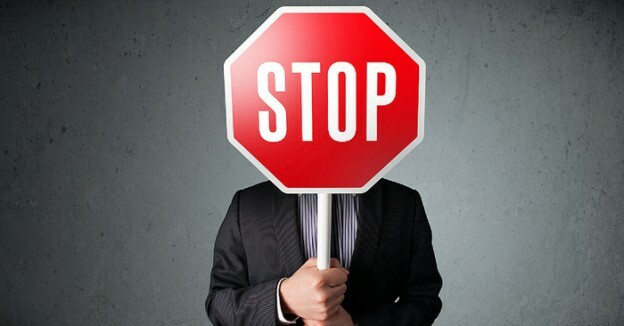 Creditors can however still take action against you if your payments are in arrears including sending your account to collections or pursuing a wage garnishment. 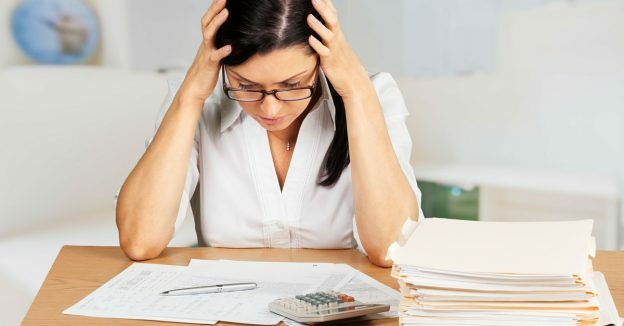 If you have significant unsecured debt, a bankruptcy will eliminate most unsecured debt with only a few exceptions such as certain student loans in bankruptcy, support payments, court fines and penalties. A consumer proposal allows you to pay back a percentage of what you owe over a period of time with no interest. To better understand how your unsecured or secured debt will be handled in a bankruptcy or a consumer proposal, talk to a bankruptcy trustee in Canada about your options. Hi. Thinking Capital is saying they are going to sue me for an unsecured loan of $39,000 I owe because I was forced to close a store. I am in the process of filing personal bankruptcy. The only asset I have is a home with very little equity. Can they make me sell my home and garnish any future wages ? Hi Laura. If you file bankruptcy, an unsecured creditor cannot force you to sell your home. How your home will be handled in bankruptcy will depend on the amount of equity you have. I suggest you discuss this with a licensed insolvency trustee who can give you a specific answer for your unique situation.